The last two weeks of development were intense. Mostly on the insides of Planet Nomads. We spent a lot of time reworking biome blending and other things that are hard to present, because they're not the shiny "oh-have-a-look-at-this" features. There were changes and optimizations in the Sandy terrain engine (Chunk Structure Modifications being one of them, but only Martin D. knows what that means exactly), database coding for saving the changes made in the world, be it a cut down tree, dug cave or built base. Then we have things still in progress (Building Vision through which you'll set and connect functional blocks), and things that are in the research and prototyping phase (Weather System). Luckily we still have some tangible features to show you today. We figured jumping around in a spacesuit can be exhausting, and frankly even a small obstacle would prove impassable. 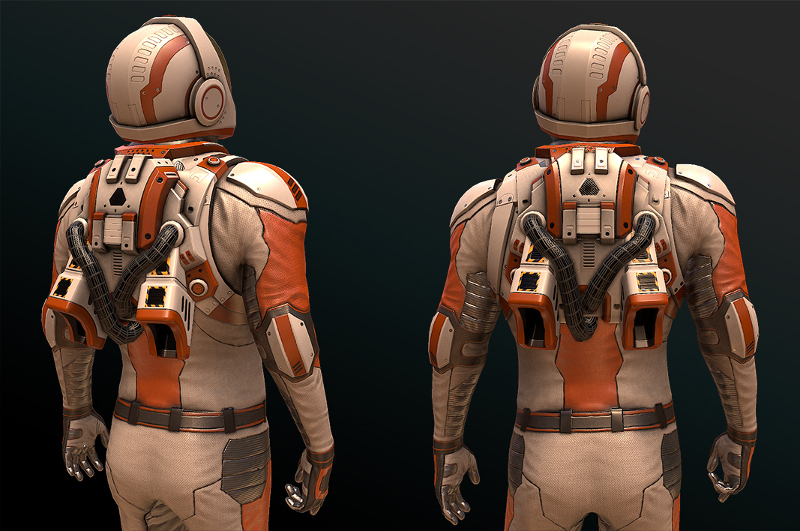 So your trustworthy suit will be equipped with upgradeable jetpack boosters. They will greatly augment your jumps, so when you get stuck inside a hole, there's still hope. Don't expect to be flying round like Iron Man though, since the jetpacks are very power-demanding. Tigerish has coded an adaptive music manager, which takes all the available music tracks and mixes them based on specific variables. It changes the music being played as you travel across a planet, as you discover points of interest or get involved in life-threatening events. There isn't much to show regarding the music manager interface, but we do have a new music track for you to listen to. We enrolled Planet Nomads to Made with Unity Showcase and greatly enough Unity selected us for the expo. So during these three days, we'll be showing Planet Nomads at Unite Amsterdam, courting the press and Maly Kuba will be soaking up the latest tricks possible in Unity engine during all the high-profile talks and demonstrations. The week of Unite Amsterdam coincides with the second episode of our monthly Nomadic Journals, so we'll be postponing the second episode to the week after that. Out of the 5-8 planned biomes we already have 6 biomes with optimized assets and revised graphics and Kubát is constantly working on new ones. Of the 5-10 planned animals we already have 9 with at least one more coming. We would like to thank the fans who updated from their Nomad tiers to Alpha. It's a confirmation that we are doing things right and a great morale booster. The closed alpha will be a starting point of Planet Nomads, and even though it won't have all the features and mechanics of the game right from the start, we'll be updating it regularly, adding more content throughout the time leading to Early Access launch in Q1 2017. Stay tuned for the monthly milestone update on Trello next Friday. That'll be all for now. Take care, Nomads.